QUESTION: WHAT DO YOGHURT POTS, BICYCLE HELMETS, GARDEN PONDS AND CAR DASHBOARDS HAVE IN COMMON? ANSWER: THEY ARE ALL PRODUCED ON ILLIG MACHINES. WE PAY A VISIT TO THE GLOBAL MARKET LEADER IN THERMOFORMING. From the coffee capsules that sell billions around the world to the boot of a car, thermofor­med plastic products have become part of everyday life. But despite this, the thermoforming industry remains a small, highly specialised niche branch. The heart of this sector beats in Heilbronn. This is home to ILLIG, not only the champion in the sector, but also the only pro­vider in the world which produces the machines and tools itself. That makes ILLIG a true system provider. The combination of machinery, tools and material-specific expertise is unique in the industry and is a recipe for success for the company in south-west Germany. ILLIG systems are used wherever there is the need today to efficiently produce sophisticated formed parts in consistently high quality. The business has 68 series machines in its product range, plus countless individual configura­tions. After all, having to quickly react to technological changes means that thermoforming is reinvented here every day. "That is why we rely on a partner like Lapp who accompany us in this development," says Karl Schäuble. "Lapp products meet our high standard and can withstand the great mechanical stresses, accelerations and temperatures in our systems." Karl Schäuble is not just the Managing Director of ILLIG, but is also the founder's son-in-law. That makes ILLIG a purely family company. Like many companys' stories, ILLIG's history began in a garage. 65 years later, it has become a truly global success story. Even it's competitors in the market produce officially to "ILLIG standard". Creating the standard is what they are used to here at ILLIG, as thermoforming is not taught at either school or university level. So it is something that has to be self-taught and conveyed to others. "We deliver the infrastructure such as training programmes with every machine," says Schäuble, who points to the modern customer and training centre behind him. All of the 300 to 400 machines that ILLIG builds every year are collected from the plant by the customer, making it a true showroom. Customer staff are trained on the machine in Heilbronn, meaning that when the customer leaves, they have the knowledge to operate the machine and can pass on the skills they have learned. As there was no specialist literature of thermoforming in the entire market before ILLIG, ILLIG's engineers wrote it themselves, compiling and organising their pooled expertise. The resulting book has been translated into seven languages and is viewed today as the bench­mark for the entire sector. The assembly hall smells of machinery oil and precision. The production here occurs in so-called "slots". Every machine goes through 18 stations which are precisely calibrated. Every day, one machine or partial components for a whole series leave the hall. "We need reliable partners who can keep up with the pace," says Sales Director Heiko Wenka. "because if our delivery times are too long, we lose our competitive advantage." So it is no coincidence that Lapp solutions can be found at the heart of every ILLIG machine. These include the new ETHERLINE® Cat.6A. This new Ethernet cable was the answer to Illig's need for a cable suitable for power chains and with enough potential for the anticipated in­creasing transmission rates for the cross communication of two safety relays. ILLIG and Lapp share a decades-long partnership which has only become more intense in recent years. Specifically when ILLIG began to get its production in even better shape for the future. The urge to improve – for some companies, it is in their DNA. ILLIG and Lapp have something in common; they both share the tinkering spirit characteristic of south-west Germany. The pair are both family companies and global players. And they are both pioneers: "When we enter new markets, we depend on a good network," confirms Managing Director Karl Schäuble. "With an export rate of over 87 %, we need components that are reliable," explains Sales Director Wenka. "When a customer anywhere in the world buys an ILLIG machine, then they buy a thermoforming machine from the market leader and rightly expect high quality." ILLIG Maschinenbau GmbH & Co. KG has 750 employees and is one of the leading providers of machinery and tools for ther­moforming and packaging technology. Over 20,000 machines worldwide pro­duce branded products around the clock. 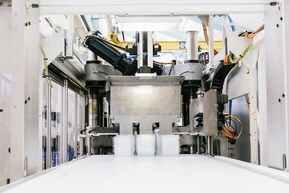 Every year, for example, around three mil­lion pots for Müller yoghurt are made on ILLIG machines.